We were a party of six adults between the ages of 51 - 70 years old. We flew from Birmingham Airport to Mexico (Dreamliner) on the 1st May 2017 for 14 nights, Premium Club return. We all stayed in the Ibis budget Birmingham Airport the night before departure. Hassle free check in at the airport and the NO 1 lounge was part of the premium club experience. Have flown Premium club before with Thomson and it's well worth the extra. Flight was brilliant and 9:30 hours departing and 8:30 on return. At Cancun airport it was the usual chaos but once out, the AC coach was very inviting. This is our third visit to the Riu Yucatan Hotel, and yes we like it. There is a lot of repeated guests. My review I warn you will be long, it will take hours to write, however I feel you deserve as much information I can muster up for future guests. Not just the food is nice, nice staff and beach, you get my drift peeps . The hotel is 5 stars, it is 5 stars because of the facilities it has, several swimming pools, activities, a doctor on site, several restaurants etc. Guests forget how hotels are marked, the more the hotel facilities have, the higher the mark. Check-in was an easy process, fill in your name, residency etc then you will be given x 2 door cards and two towel cards, please don't lose them, you may be charged. You will get a sticky label to put on your luggage with your room number on. The staff will bring them to your room, please tip 20 peso each suitcase, that's a quid in UK sterling. Currency - Unless you come from the States or have $ floating around, please take Peso. From the British point of view, you will get more for your money. Dollar currency although widely accepted, will lose on the exchange. If you take sterling from home, the reception will change it at a better rate than Thomas Cook for example. In room safe - If valuable items are not placed in your safe, then hotel management will not be responsible, #tip# take a photograph of valuables in the safe in should case they go walkabouts. Problems in your room - please contact the front desk on ( ext. 9/1001/1002) they will send a repairman out to you. Front desk - can help with taxis, information, arranging a Doctor and collecting more free bottles of water if you need more. In reception there is an electronic large board for information, animation times and shows etc, plus the weather. Towel hut - is situated by the main pools near to the sea front. You can exchange as many times as you like in the day, hand your towel card in and you get it back, when you return the towel. This is open from 0830-17:30pm, starting from 20:00 hrs, the pool technicians are cleaning the pools for the next day. Sun loungers - shouldn't be reserved but they are, especially by the animation pool, the Ibiza pool near reception should be the quiet pool, no unaccompanied children, no floats or ball games. It's becoming more popular this area with the Brits. Where the Americans and other nationalities commandeer the swim up pool. Free loungers everywhere and the beach lads will track one down for you. A tip would be nice for them, you try and carry six loungers at once on your back ! Use bottled water only ! However ice cubes are safe at the hotel, as is food that is washed, e.g., tomatoes, lettuce, to name a few. Ice machines - These are located on the ground floor of every building. Snacks - From 22:00pm the out of hours snacks are available, hot dogs, sushi, tacos and sauces, sandwiches. Other information - You can use the facilities of the Tequila and Playacar hotels except evening dinner. We used the pools and had drinks most days at each of them. Animation team - Work extremely hard, it's preference which hotel you prefer, so we went to different ones. Beach - This is the best beach on the strip, if you walk along the beach to PDC it's awful, seaweed, dirt and stinks to high heaven. Fair play to the Yucatan, palace and Playacar hotels for burying the seaweed. Flags are out, yellow is beware of currents and red is danger. Believe me the under currents can be strong and can take you miles away. Lots of activities on the beach, canoes and body boards free, quite expensive to use jet skis and paragliding. Thomson reps - Been on virtually every excursion either with/without Thomson, some on our own by taxi as cheaper. The reps were really nice, no issues and were not pushy. They are both in resort most days, also a swap box is available should you run out of anything. Some tips - Take antihistamine tablets a month before travel and during your holiday, helps with mosquitoes. Buy a body butter aftersun, lasts 12 hours, I recommend Hawaiian Tropics. Great for moisturising and keeping a good tan. I recommend factor 50 Australian gold sun bronzer cream. Lower factors no use, it is extremely hot and Mexico is near to the Equator. I wore it and my family and came back nearly black. Drink lots of water, and flat sprite if you get tummy troubles, eat plenty of chicken and white bread. All food is ample. I tried the Asian 3 times, steak house once and the Italian once. All of them are fantastic and no need to book. However the Mexican you have to book, didn't go as not getting up at 0700 to do it. Staff are lovely and work really long hours. 1: At the main bar in reception, you have the smoking and non smoking area the wrong way round. Non smoking should be bar area, and smoking at the back. Otherwise, all non smoking guests have to come to the bar smelling like cigarettes smoke. I vape myself but family were smoking and we all felt this needs addressing. 2: it would've nice to have an outside seating area near reception bar instead of inside as very noisy , perhaps a few tables/ chairs on the green near Ibiza pool? 3: one last observation, if at the Ibiza pool, guests miss out on the BBQ, can we have chefs come up to the Ibiza pool at lunch time ? I want to thank all staff and guests we made friends with for a fantastic time, we will be back, no other place I have been to in the world offers great food and drink in the middle of a mini jungle. Great ambience and lovely surrounds. The walk into Puerto Del Carmen is well worth the look at the mini ruins. Any questions please ask, and I am hoping I have given you a little incite to this fantastic resort in Mexico. Fantastic hotel, been twice, going back next year! My husband and I stayed at the Riu Yucatan Hotel from April 29th - May 13th 2016. This was our second visit, the last time was February 2013 before the refurbishments. Firstly I will tell you quickly about our flight from Birmingham airport (UK). We flew the Dreamliner, Premium Club, anyone wishing for a fantastic flight (9:45 mins) and in luxury with only 49 passengers and so quiet should consider it. You are truly looked after. What’s the difference? Well, lovely food with proper utensils, spirits in small bottles and you get two at a time. Everything is free except extra snacks, much wider seats and leg room (I am 5ft 9ins), great comfort. You are on and off the plane first and your luggage. Outgoing you have a pillow and blanket and amenities which are socks, toothpaste/brush, face cream and eye mask etc. Returning flight they gave you a proper duvet and pillow. The food is really nice with a menu and plenty of it. You can walk about or stand at the back with loads of space, toilets have full size dress mirrors. The staff come around with ice cream and hot flannels through the flight. It was so so quiet, lovely, and loads of films to watch and entertainment. Well worth the money in my opinion. You came off the flight not realising how long you were on it. In 2013 when we came it was old style and had a great Mexican feel to it, now it is bright and more updated like the rest of Mexico, I understand they had to do this, but to be fair, now it could be a hotel anywhere in the world. Either way it is nice but a shame it doesn't look Mexican any more. We were situated behind some trees up near reception near the Ibiza Pool (quiet pool), our room number was 1610 at the end of the corridor with only one guest next door. We got Wi-Fi free in the room, balcony, beach, restaurant, reception, in fact everywhere in the hotel. It was a good room for that. The room is basic, but has all the things you need, hairdryer and soap, and shower gel in the shower that doubles up for hair shampoo as well. The shower has great flow and power. Good free safe, the battery did go in the 2nd week, but 5 mins and was powered up again. We had a very good house keeper, animals displayed on the bed every day except Sunday, when another lady did our room. We left a quid in pesos every day, and as the pop and beer/water was re stocked every 2 days, we left a tip in the fridge, and they left loads more. Never actually asked for more as it’s free anyway, but that was nice. If you run out of bottled water as you cannot use the tap water, reception give you more. We were lucky we heard not much noise from the rooms below as we were top floor, except banging of the odd door. Food ....... as you have read, lots of different restaurants, we did eat at the Italian at lunch with no reservation, nice and quiet, but be dressed properly. The food is beautiful, the best all-inclusive we have had and it never shuts. The reception bar open all night, and after hours for snacks which opens at 10pm. I have given the hotel and surroundings 5* because we had a great holiday and nothing whatsoever to complain about, however, I made a few observations whilst here that I wanted staff to be aware of. Since the refit/refurbishment, I personally feel the reception bar is in the wrong place. The reason I feel it is, is because when at reception and the bar is busy, it is very hard to hear people speak. Also because now the bar has like a marble top, whenever the bar staff bang the shots on a plastic grid it is so so noisy and echoes all around. The bar itself is very noisy at night as everything echoes, at one time everyone used to be down near the theatre having drinks, but now it’s in reception and after two weeks it’s a bit much. If you want a quiet chat at night forget it. We often went to the other hotels at night the Riu Tequila and the much quieter Riu Playacar, its nice for a change of ambiance. As people have stated, the beach is one of the best, and the weather was perfect, it did rain a bit on a couple of days, but dried up and it was at times when you are not bothered. Plenty of sun beds, always got the guy on the beach to find one, tipped of course, carrying two of them on his head deserves one. The Thomson representatives were nice and actually for once did book trips with them. Usually we have booked across the street at the Plaza in the tour shop next to the coffee shop, as a lot cheaper and excellent. We decided to go with Thomson this time because people we met were going on the same trips. To clear up any doubts people may have, if you have booked a Thomson holiday and you have their insurance, if you decide to go on excursions and have an incident/accident with another company, you will be insured on the other companies insurance but NOT Thomson. However, if you come over with independent insurance here in the UK, then you can use any tour company as you are insured yourself. So many people were getting confused on this issue. The trips we went on were Chichen Itza, which was fantastic, the Captain Hook on a Galleon which for me was the highlight of the week, and Xplor Park with the zip lines. I have written a review on those separately if you are interested. As we went in May, it is extremely and I mean extremely hot, I usually wear factor 30, but this was not strong enough. In fact I wouldn't bother buying any sun cream at all from the UK, buy it at the Plaza. I had to buy factor 50 Australian Gold with bronzer, even with this we burnt 3 times. Its great cream and you have a great golden tan. It’s not a total sun block, I will use it again. There is a lot of activities that goes on the hotels, parties, shows, and the animation team work hard. 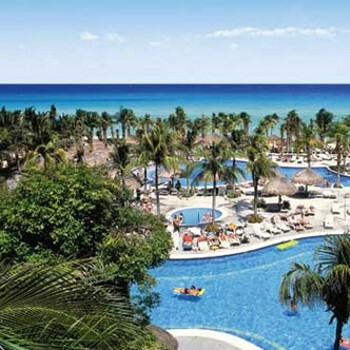 If you want a lively hotel then this is the one, be careful which hotel you choose out of the three Riu hotels which you can use their facilities. Yucatan lively and on the beach, the Tequila more English and Scottish, the only one left that is Mexican but has a lovely atmosphere, the Riu Playacar, quieter and is great for the disabled, or wheelchair access, nice hotel and has been revamped. The Riu Lupita, is about 40 minutes’ walk from the Yucatan, turn left out of the hotel, it’s quite away from any other hotel and smaller. They will not let you in to view, but has got a golf course next door to it. To be honest apart from the Riu Lupita, I would go in any of the hotels here, as its the Riviera Maya it is beautiful, please do not expect sky scrapers here like in Cancun, its more Mexican, tranquil but with lots to do if you wish to do it, as everything is on your door step. Taxis are cheap, but you can walk to town, or along the beach, hire bikes or quads etc. Mexico is lovely, and although expensive to come here, when you are here it’s hard to spend any money, except tips. Really loved our stay again, and could not fault one thing, even the weather was perfect. Choose your hotel wisely and area for your holiday, it does make a huge difference as they all are different but have great qualities. Cannot wait to go back, miss you guys already. Hotel tip: If you want wifi in your hotel room, ask for a block near reception. Best All inclusive ever ! When we landed at Cancun, the nightmare of hustle and bustle began, very slow getting suitcases off onto the carousel. Once suitcases are received you go through the red or green light, you want to pray you get the green light, if not you have to tip out all your luggage in view of everyone. On the flight you have to fill out two forms, one for the whole family, the other for the exit tax. Remember to keep that teared off piece of paper, we kept in in with the passport. You require this to get out of the country. Once outside in the glorious hot sunshine, the men are at you to take you to the Thomson coach. Of course they want tips. Next time we go, we would do it ourselves, but being worn out, they showed us the way. It is not hard to find. Once on the coach you get a Thomson booklet for the welcome meeting the next day. It takes an hour to get to the Riu Yucatan and it was the first stop. Suitcases off and then we were all ushered into a lovely reception. The check in was so simple and easy. No need to show passports etc, there were a few of us that got off at the RY, all keys etc, information, a towel card each and a lovely welcome drink took 5 mins. We just needed to fill a card out with name and address that is about it. You are given a room number and it is on your keys to the hotel room. A sticky note with your room number goes on your luggage so the lobby staff can bring it up to you. I can go on forever on this hotel, but because a lot of reviews on trip advisor are true, i shall break it down, so it is hopefully easier for you to take it in. Hotel Lobby - Is open plan. There are two guest telephones next to reception with private door. You get 1.5 hours of free wifi or, buy a card from next to shop in reception for 200 peso for 24 hours. You can buy phone cards. There is one great bar, a fridge next to it for snacks. two x shops for t shirts, sun creams, holiday gifts. The lobby is a smoking area, loads of ash trays supplied. One Main restaurant - great selection, loads of choice. At the back of the main restaurant is the Asian restaurant which is bookable between 0700 until it is full. There is a female and male toilet in reception. All reps in the foyer of all nationalities. Rep boards with trips and return flights. Every night in the reception/foyer is a theme night, something always going on, eg, Gambling night, games, Mexican and we had a live female singer, lovely voice. Sofas, tables and ample chairs as well. With the free wifi, this will only work in reception, whatever time you go online, is the time you go free the next day. If you pay, you can get it in the bedroom, theatre and reception. Very quiet and in between reception and the beach bars, the third floor, great view of the jungle. 4 x optics in bathroom, Tequila, Brandy, Vodka and Rum. Fridge refilled every two days with, beer, large water, soda, and fanta, 7 up etc. Old style safe fixed to the floor in wardrobe with safe key you need to keep with you. Ancient CRT TV with minimal stations for British guests. Bed side cabinets either side of bed. Table and chair in room. Fixed inside patio door is a mosquito mesh door, so you can keep it open at night as protected by the mesh, so no mossies at night in your room. Air con fantastic, easy to use. 2x plastic chairs and table on the balcony, also a small clothes dryer outside. If you want to have your clothes washed, then that service is available. Blankets if it gets cold in the wardrobe. and a resident cat ! Theatre - great shows grease, Michael Jackson, Mayan show, Mexican show, they are lovely. The entertainment team work non stop and it shows, always smiling and get the crowd going. There are toilets at the side of the theatre. From behind the mexican you can pick up the free buggy cart and go to neighbouring Tequila and playacar hotels. To Reach Playa del Carmen by Beach. Go down the steps to the beach, once on beach head left and walk as far as the ferries to Cozumel, or when you see the bar "Senior Frogs" This is the longest way and can take up to an hour depending on your walking speed. This then starts up an array of shops from tack to designer. If you want CoCo Bongos then that is situated on 12th street at the left side end. If you need the Doctor, reception said they charge $100, but she doesn't unless you need to go to the hospital, you will need dosh though if you need the pharmacy after the doctor has given you a prescription. Meds are expensive all over PDC or Playacar, £7.50 for 50 paracetamols for example. If you get migraines do not hesitate to see the Doctor, mine got that bad and the migraines are due to the low sea altitude, it was very high and i needed BP tablets, i was in agony, but they worked and i have claimed my money back from the insurance company. Outside the hotel from the front. Under the arch at the end of the car park, turn right, over the road, maybe 3 mins you can try out with your wrist band the Riu Tequila, nice hotel, similar layout but food is not as good nor the choice, you can use this hotel as you wish all day except for dinner at night. THE playacar plaza with an array of shops is just past the Tequila. Over the road again RY side, walk for about 8 mins then you reach Playacar hotel, also similar but a lot quieter than the other two. Never ate or drank there. Carry on past the Playacar for 30 mins you will pass on the same side ruins as you walk into Playa del Carmen, a lovely walk and you get shade where you do not on the beach. Takes roughly 30 mins at a gentle pace, or £3.50 (70 Pesos) in a cab. If you want a cab, do not pay cab prices on campus, haggle outside they are cheaper. My advice pay in peso it works out cheaper. We booked at the travel agency it is called Maya Tours next to Starbucks, they show you what your trip entails on a huge lap top, very reasonable, we did Tulum, Coba Ruins had lunch, went to the Mayan villages and went to Akumel beach at the end to swim with turtles in the sea. Trip pick up 0730 and back by 5pm. You do a lot, the tour guide was fabulous, lunch which was great was all included plus beer, and water, soft drinks all free in a small mini bus. You have the choice around coba of free bikes or you can travel for a quid on a tuk tuk style bike which was great fun. I wouldn't advise at the plaza to use the kiosks, you will be with different nationalities and you do not get get the personal touch. They certainly have mixed reviews from other guests we have spoke to. One report on trip advisor said there was a sickness bug going around and the rep did not take any notice. Well i was there the same time, no one was ill, if it is bad news it would spread like wild fire. My personal thoughts are they over indulged on the tequila, or ate too much food. The only things i heard about was catching possible germs from the amount of guests in the swimming pools, eg, ear ache, coughs and colds. we locked everything away in the safe, not one thing went from our hotel room, we were happy with all the great staff, house keepers etc, and left tips every day and came back to flowers, and towel art. Unfortunately some guests in their 50s from the beach had electrical equipment taken from their beach bag, then pinched the key and ran sacked their hotel room as your room number is imprinted on it. Also my holiday friend had a pair of trousers taken from her room that she wanted to travel home in. I believe the beach incident could have been a chancer on the beach eg, a fellow guest at some hotel. But then why take expensive items on the beach, why chance your belongings when someone could have kept an eye on. Safe keys have ribbon on, so you could walk around with it around your neck? We had Lindsey and Miquel, they live in the hotel and so therefore they keep good times for you to see. A very good welcome meeting, very knowledgable except for not mentioning about the clinic ! There trips are way way to expensive, you see for yourselves, go elsewhere they are same trips but double the price. I would like to say we had a great time and met some fantastic holiday friends, so hi to the Speedys (Ruth, Brian and little Elliott) our friends from Cornwall ( Julie and Ralph), Madge from Benidorm ( Great Yarmouth), our canadian friends and everyone else from my Benidorm crew. The hotel is closing for 3 months, the tennis courts are going, a pool in its place and bar, the lobby being upgraded and the rooms. Also a new restaurant in reception is being built. I do hope they do not spoil the Mexican feel to it. We heard the Playacar hotel is being knocked down, but do not quote me on that its hearsay. Ps, be aware of the Yanks, very noisy at the pools, they carry around ridiculous drinking vessels because they cannot walk anywhere. They show themselves up because they cannot hold their drink. They take over the pools and bars. The Canadians are lovely people and very friendly as were all Brits. We would love to go back and we will sometime after the refit. You will not be disappointed, you will not get a friendly hotel. We stayed at this hotel as a last option after having our Egypt vacation cancelled. From the moment we arrived we knew we had chosen a good hotel. The staff were all wonderful and do anything to help you out, the hotel and grounds were always kept spotless and the entertainment team worked hard to try and help you enjoy yourself whilst not pestering you if you just wanted to relax. The hotel itself is part of a group of 3 and you can use the other hotels when you want but if you wish to eat at them in the evening you must reserve table at your hotel first. The food was very good in the Yucatan restaurant (self service) as are most all inclusive. There are 3 speciality restaurants in the hotel, a Chinese (food average), Mexican (did not go here) and a steak house (ribs to die for) and the steaks were good also. These 3 restaurants you had to reserve in the morning so earlier the better. The drink was OK as far as All Inclusive goes watery beer but cocktails/shorts were OK.
Hotel is situated beach front with miles of white sand and warm sea, and you can walk to the town in about 20-30 mins. I would definitely recommend this hotel. You could book speciality restaurants as often as you wanted but it was on a fist come basis in the morning so popular restaurants booked by 8am. The room was clean but had awful smell think it was sprayed by some insect reppelent other rooms booked by friends were fine. The smell seemed to linger in our clothes when we got home but once washed were fine.Lots of drink on offer and you could even get brand named such as smirnoff vodka still free if you asked for it/ Staff very helpful. Overall we had an excellent holiday, the complex and the rooms are always kept clean, food and drink were excellent, bar staff were first class well worth tipping them, service gets even better when you do. Entertainment was a good standard compaired to alot of hotels we have stayed in but it wasn't personally our cup of tea. We would have no hesitation visiting the hotel again but we prefer to go to different locations. Stayed at The Riu Yucatan for the Christmas/New Year holidays. Arrived after a 6-hour flight delay. As soon as we arrived we were greeted with a cocktail and smiles all round. Got to our room but unfortunately it was right next to the late night bar, a few years ago this would of been no problem but we aint so young as we used to be, so next morning we asked if we could be moved. This was done with no fuss and we were soon unpacking in a room in a quieter part of the complex. One thing about both the rooms was the smell of damp, quite strong until you got used to it, although there was no sign of damp anywhere. Also the drains niffed a bit around the grounds although not all the time. Something to be said for our own building regulations I suppose. The staff were all superb, friendly and helpful hardly a glum face all the time we were there. The rooms were well cleaned every day and the mini bar replenished every other day. The food in the main restaurant was really very good, a very high consistent standard considering how many mouths there are to feed. The special restaurants, Mexican, Steak and Oriental are also very good, but you do have to book for them when you go in for breakfast in the morning. We travelled with Thomson with a great start of a 6 hour delay! That coupled with the fact you have to pay extra for drinks,movie upgrade and even have to take your blankets and headphones for the return flight, not a lot of fun with four young children! Rooms are small and my biggest gripe is they have no views! You are in the caribbean and no rooms have views of the sea. Our room overlooked the hotel next door. I do not go on holiday for the room but it would have been nice to sit on the balcony in the evening but there would be no point. The serial sun bed hoggers!! Why go on holiday just to get up at 6am for a sun bed?? Such sad people. Compared to how many people use the pool too few sun beds and the sad people who get up early to reserve them brass me off. The buffet restaurant was like school dinners, queuing for food. Nothing special and the asian restaurant is buffet too and crowded. You had to wait ages for drinks so no chance of getting drunk! Coffee in the morning could be slow too. Best part was definately Lillian from the children's club. My children really enjoyed it although she did have rather a relaxed attitude (my husband was left in charge one day!) but the children had fun. All in all Mexico is great but this hotel is not!